Using UberMenu with Themes that do not properly support WordPress 3 Custom Menus, or adding an additional menu to your theme. 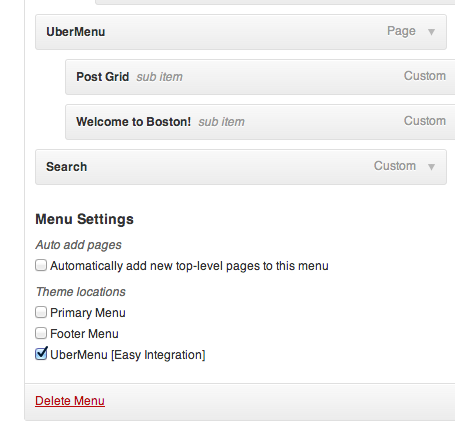 UberMenu works by applying filters to a WordPress 3 Custom Nav Menu. These menus are inserted into the page via your WordPress Theme. 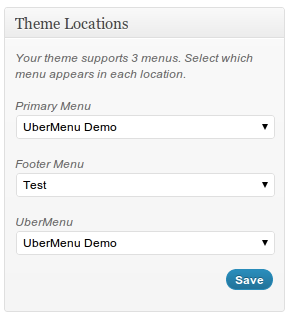 Normally, UberMenu automatically replaces your theme’s WordPress 3 custom menu, when WordPress 3 custom menus and theme locations are supported. If your theme does not already properly support custom menus, or if you wish to add an additional menu, you can add support by turning on UberMenu Easy Integration and adding a line of PHP code. Note: you still need to be running WordPress 3.3 or above for this to work. 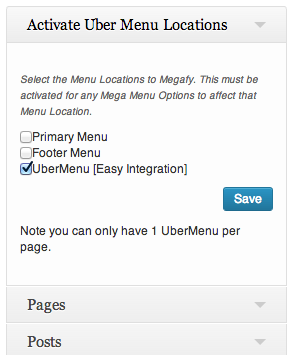 If you have already applied uberMenu_easyIntegrate() via a filter or hook (following one of the theme integration guides, for example), you can skip this step – the hook code has already placed the menu. Now that the theme supports WP3 Menus, we’ll need to actually insert the menu somewhere in your theme template. It is always recommended that you create a Child Theme and make your edits there, for maximum forward compatibility and ease of maintenance with your theme. Most premium themes include a starter child theme in the download package. wp_nav_menu without proper use of the theme_location parameter. though it can vary depending on your theme. code where the menu should be displayed. Usually this would be inserted in your theme’s header.php file, but again this may vary depending on your theme and your goals. If you are adding an additional menu, you’ll want to add the code wherever you want the menu to display, generally within your theme’s header.php. Note: The above menu call should never be located inside <ul> tags, even if your theme’s default menu is. If you are removing residual styling, you may also need to edit or remove the class or IDs of the div/nav elements surrounding the Easy Integration code. If you are adding UberMenu to a widget area / sidebar or content area, normally you’ll want to add the Easy Integration shortcode within a text widget to place your menu. You can also place the PHP above in the sidebar.php, for example. You place the text widget containing the shortcode in a widget area defined by your theme, not in a custom UberMenu Widget area. Completing the above two steps should successfully enable your theme to work with UberMenu, giving you an “UberMenu” theme location in your menus panel. Now just configure UberMenu as usual!